Simplicity has a sale on! I had to hold myself back, I have a number of patterns that I would like, however I managed to stick to 4. 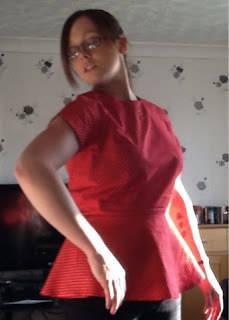 One of the patterns that I got was Simplicity 1699, it has 4 patterns with it and I chose to make the peplum top in a red polka dot cotton/poly mix. This was quite a quick pattern to complete considering that it's almost a dress with all the pattern pieces, so I look forward to making the dress at some point. 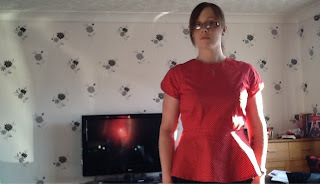 I didn't quite fancy the short sleeves, so I used the pieces for the longer sleeves from the dress. Some of these pics almost make it look like I'm wearing a paper bag, but I swear it doesn't look like that in real life. 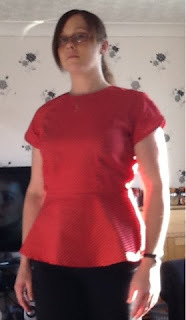 The top could have done with being a little more snug, but I like to have a bit of ease. I don't know how the photo's came out so badly, or why I'm not smiling! 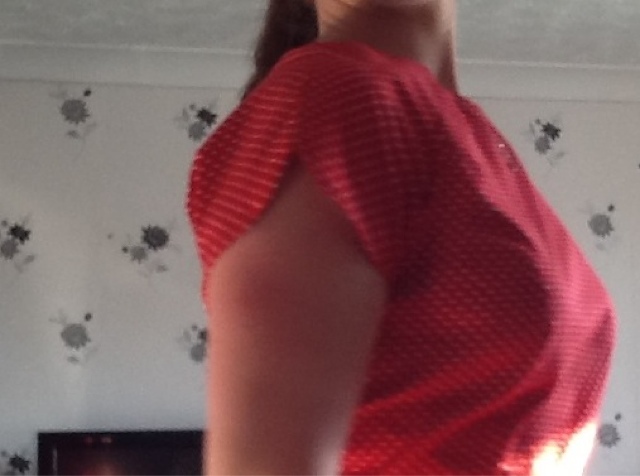 I would, however, like to point out that we've spent half the day down the pub in front of the sun, so a mixture of Baz being a bit drunk and me being a bit sun sizzled has produced some rather rubbish pics!!! The detail on the sleeves is lovely, the way the edge is curved, but it confused the heck out of me when I started to created the hem, I just didn't even click when I was cutting out the pieces, but it's a nice finish. I meant to use the instructions this time, but I got a little carried away and forgot all about them! The pieces all came together quite neatly, this was quite an easy garment to construct. I think it's time for that challenge that I've been putting off, I think it's time to make those trousers... Watch this space!! !